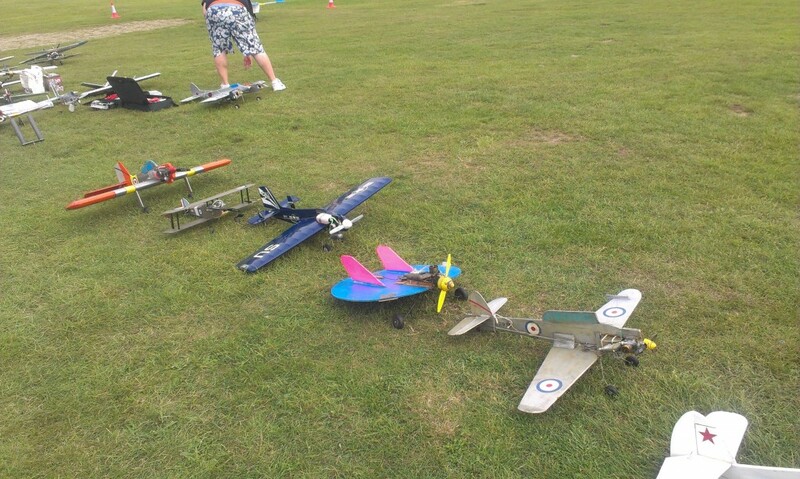 The third and final ModelAir meeting at Old Warden in 2014 took place at the end of a summer blessed by better-than-usual weather, and once again HMS Incredible benefitted with two bright, warm days and a bumper turnout of pilots and models on the Sunday. A couple of the more picky pilots did moan quietly that a bit MORE breeze would have helped their slow times, but for us guys in the lower half of the field it was a delight to be there. I use the term “guys” in its modern, multigender sense, because it was great to see Yvette Horton flying her .15 Wildcat alongside the rest of Team Phillipps, and flying it very well too. 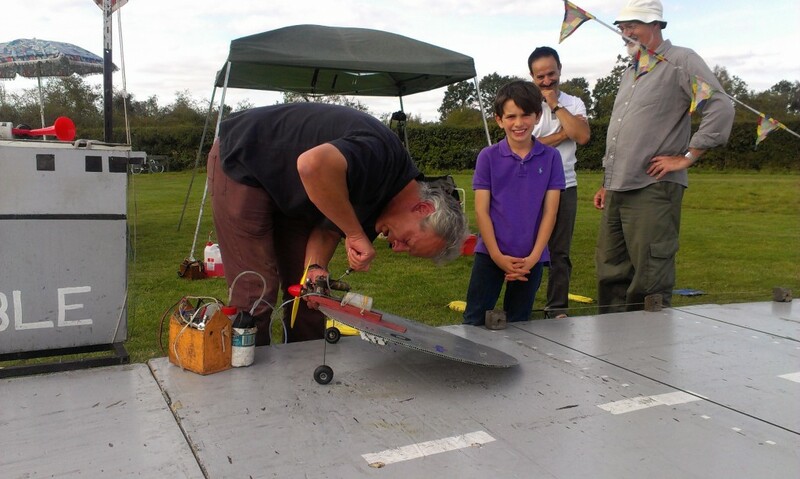 As usual, Andy Housden started off the flying on Saturday, scoring a very satisfactory 201.1 with his ruggedly effective Seamew; he obviously felt good enough about that score to step out of the circle and commence his main role as Contest Director, leaving the rest of us to catch him up. 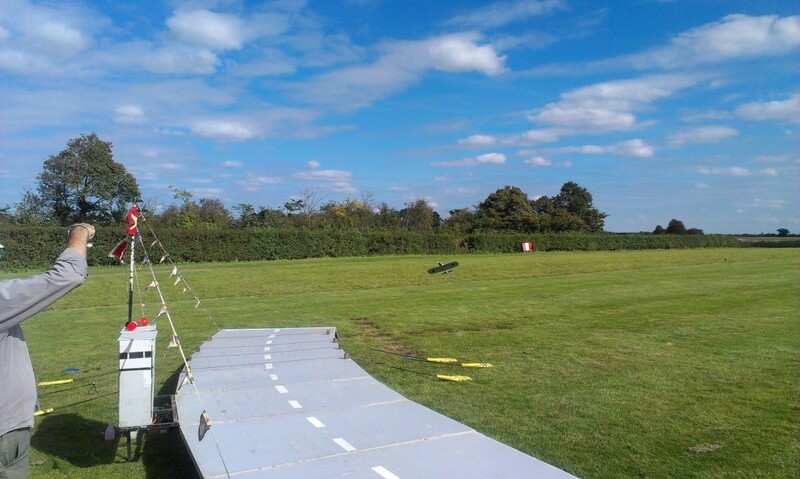 Although deck action could have started at 10.00, setting up and a general aura of chillax-ation meant that Andy’s kick-off flight only got airborne at about 12:15. In fact, just seven pilots flew on the Saturday, recording thirteen flights. Also flying a Seamew, second pilot on deck Fred Skinner made his intentions clear from the off, notching up a very good 211.4 thanks to a 131.5 slow sector, and would have bettered that on his second flight but for a 40-point landing that reduced a possible 223.9 to 163.9. He’d confided to us in the pits that his goal was to score more than 220 points at this meeting for the first time; having given of his best for the day, he decided to strike the Seamew down and returned to the pits to recover – his hands were still shaking from the tension of the second slow segment, which had been clocked at a very competitive 138.5. Was there more to come from Fred on Sunday? The picture shows Fred’s Seamew hanging right on 30 degrees as it saunters past HMS Incredible. 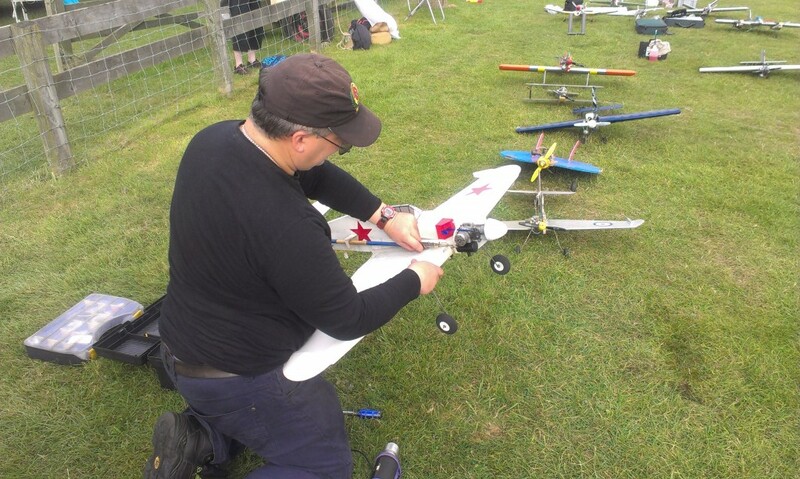 The ever-reliable Andy Green brought a nicely-finished Mitsubishi Zero to the deck next; ASP 36 powered, this was another model I’d not seen before, and could have been new to Andy – his first two flights seemed to bear this out as he ditched after the fast sector on both. Third time was definitely luckier, and he looked much more comfortable at the handle, scoring a respectable 175.5 after a perfect touchdown. 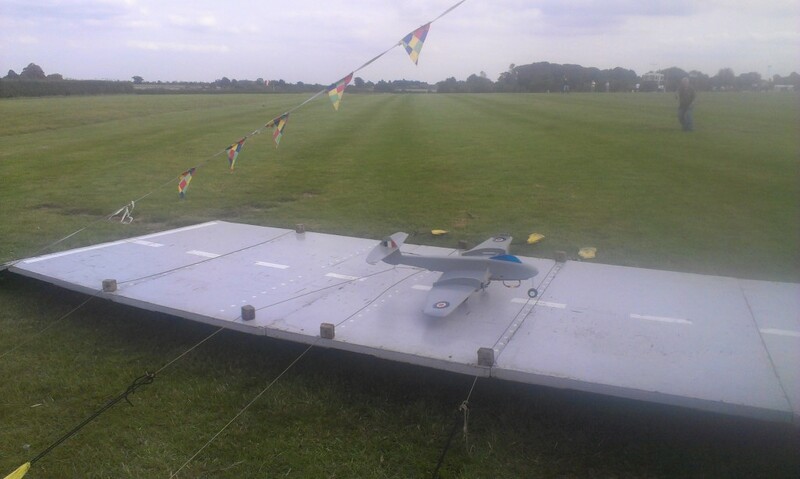 The picture below shows the Zero just before it ditched on its second flight. Two more intrepid aviators tried their luck before the signal to stop flying sounded at 16:45. David “U-2” Cowburn from Hull launched his SC32-powered spyplane and flew two solid, workmanlike missions, totting up 167.2 and 173.9 points; his is still one of the fastest models on the circuit, with 28.7 second sectors on the sprint. Finally, Yvette Horton brought her SC 15-powered Wildcat to the deck. Yvette is Bob Phillipps’s daughter (and therefore John’s sister!) and from the natural talent she displayed, she has clearly been a C/L flyer since she was first able to grip a handle. Although she ditched on her two flights on the Saturday, us chaps were keen to see how she did on the Sunday, now she was used to the deck and venue – and we weren’t disappointed! An interesting interlude during the afternoon was a visit from Ali Machinchy’s Dad and son. 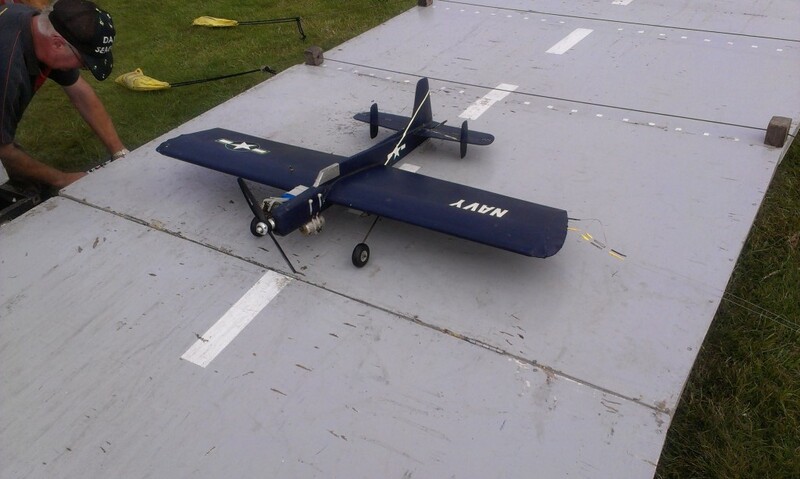 If you haven’t heard of Ali it’s because you’re an out-and-out control-line flier, and Ali is the same in R/C. 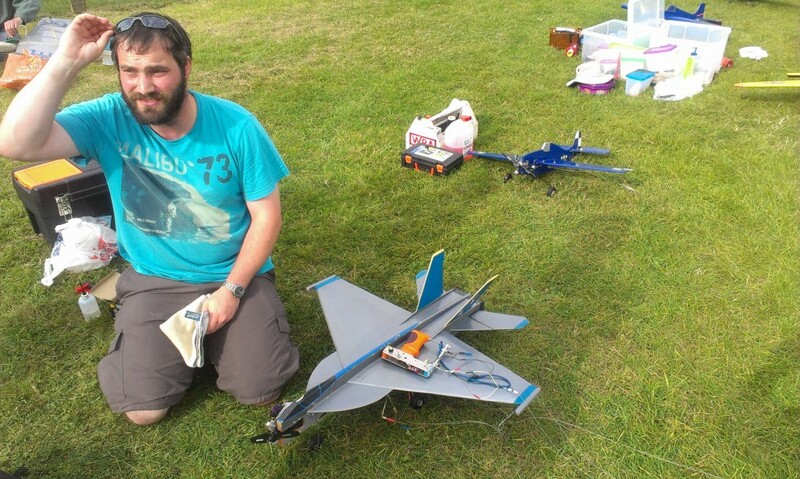 He’s not just any R/C guy either, but one of the most talented scale builders and fliers that the UK has produced in years, so much so that he has now beem headhunted to work in the USA. Ali’s dad and son were manning the family sales stand in the Aeromarket at OW, and had wandered over to see what we were up to. 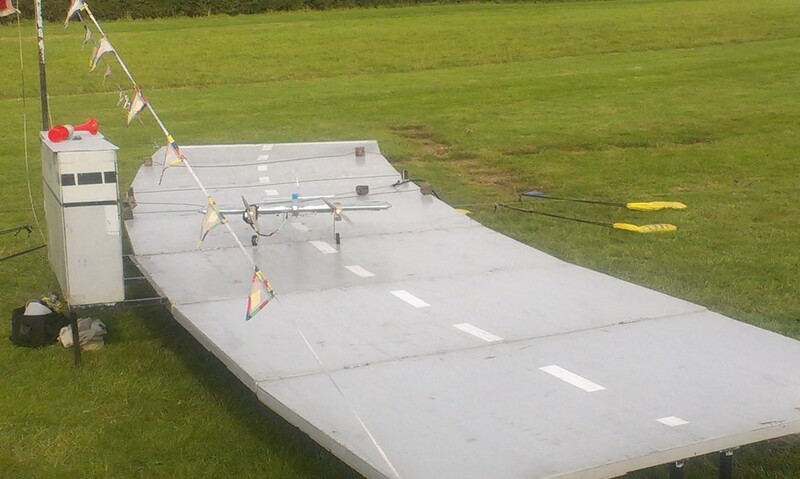 Son Zac is just nine years old, but already a very good R/C pilot, so Andy and Mike Welch immeniately asked if he’d like to fly their beginners’ cardboard flying saucer asan intro to C/L. The answer was an instant “Yes!” so Mike set about prepping, instructing and then watching (with the handle thong firmly gripped!) while Zac made three flights, soloing on the third and making a 100-point deck landing! Oh, to be young and talented! In between this little diversion and the competitive carrier flying. 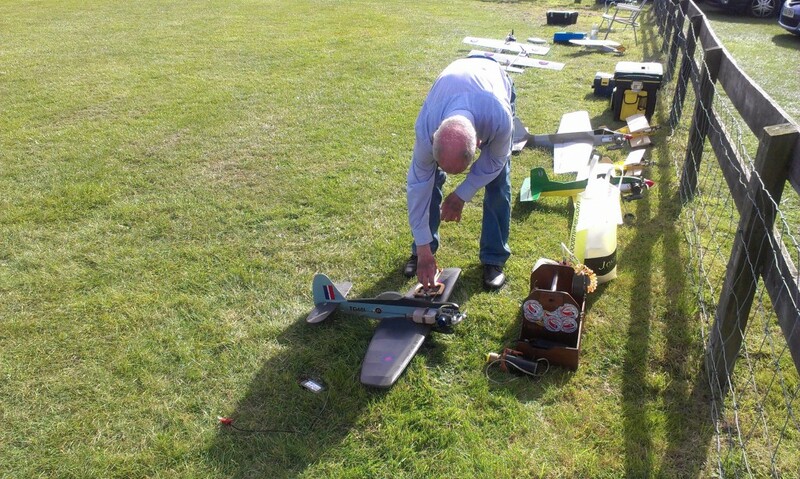 Mike Welch flew his electrically-powered Avro York (about 80″ wingspan) off the grass, with a lovely scale take-off run and a very smooth flight and landing. I’m just old enough to have seen the last full-sized survivors parked up on Heathrow’s south side in 1959 or 60 – old fashioned even in comparison with the DC-3s, 4s, 7s and Constellations (ahhhh!) that were the mainstay of piston-engined continental travel at the time. With those happy memories buzzing around my head I packed up and headed back to the hotel, wondering if I would score any points at OW this time. 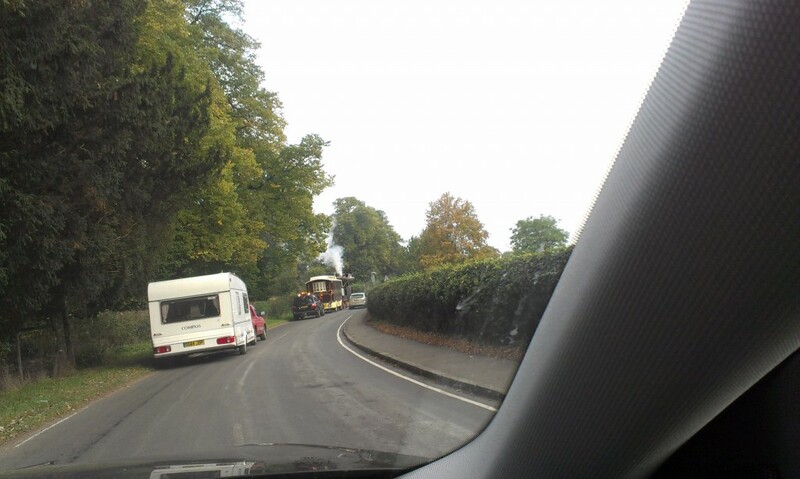 All the OW meetings so far have coincided with a display of traction engines nearby – wonderful to see but rather frustrating to follow on the road as they amble along at 4mph – especially if you have an urgent need to scour the OW Trade Stands for some decent replacement fuel tanks! The pits were filling up fast by 11:00, with later-comers having to squeeze in anywhere they could. Team Philipps were out again in force, with their main effort focussed upon John’s Sea Hornet, which had had (I was told in confidence!) some useful upgrades in the motor area, bringing it nearer to parity with Peter Tribe’s Meteor. John’s trade-mark Surfer’s Shorts were much in evidence throughout the day although they sometimes looked perilously close to ditching, so much so that I did hear someone offer to bring some braces along next time… futherst from the camera in the picture above is Chris Howells’ fleet (a new Sea Balliol, with all the hardware transferred from the Zero that I carelessly wrote off in July, his WW1-class Pup and a very nice Guardian with electric throttle control that he’s still setting up.) Next is an aberration best described as a Pink Panther whose owner I couldn’t identify, then George Ford’s famous backwards-ditching Skua anf the fin of Nick Ford’s new Sea Hurricane in Soviet markings. Over in the Air Operations centre Chris Howell launched his Guardian three times – it ditched during the slow sector on flight one, the second was completed but only made 20 landing points, turning a potentially 200+ point flight into one notching up a more modest 122.1, and the third ended in a DQ. However, this model has real potential, is very nicely presented and Chris will succeed with it, I’m sure. Next in front of the blast shield was David Cowburn and his U-2, which has been rather unpredictable over the last few metings that I’ve attended – maybe it’s the curse of Flyco? 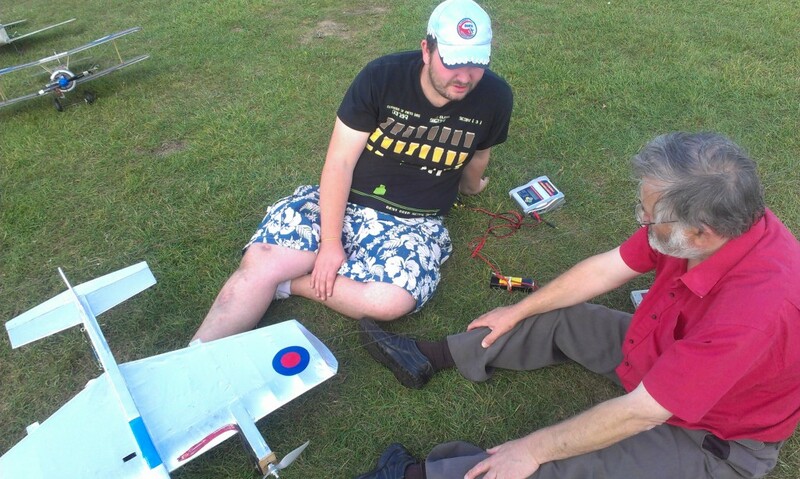 Anyway, the erratic pattern continued with Dave recording one attempt, two ditchings and one completed flight for 135.4 point – I was busy installing new fuel tanks while he flew but I did get the impression that at least one flight was jinxed by a failed throttle control, stuck on full chat, but I might be wrong. Here’s the CIA’s favourite aeroplane hooking up at the end of its one completed flight. Fred Skinner was champing at the bit to pursue that 220-point flight that he’d promised himself, and launched confidently. His slow sectors were very impressive, with the OS LA40 purring like Her Majesty after a good referendum result! 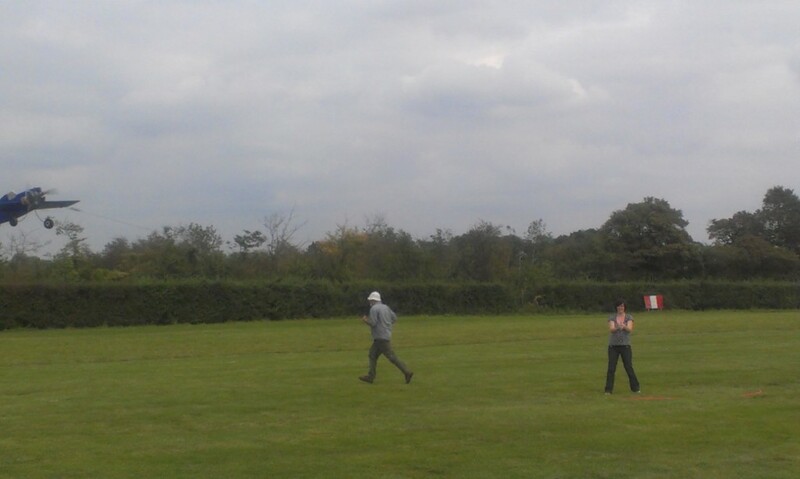 Fred’s first flight scored 215.5, with the target clearly in sight and attainable. The next sortie brought home the bacon, with an excellent 221.3, after which Fred retired in a happy haze for a cup of something fortifying. He deserved all the congratulations he received for setting a target, believing in himself and achieving it – well done, Fred! 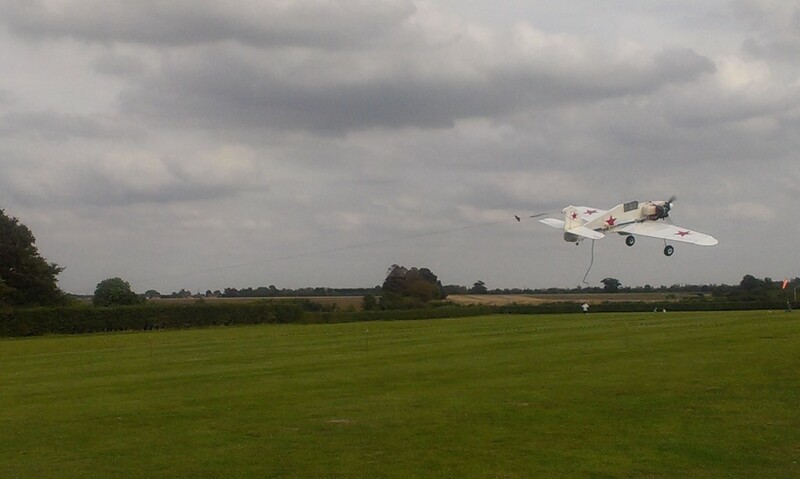 The picture below shows his accurate and controlled flying at its best. 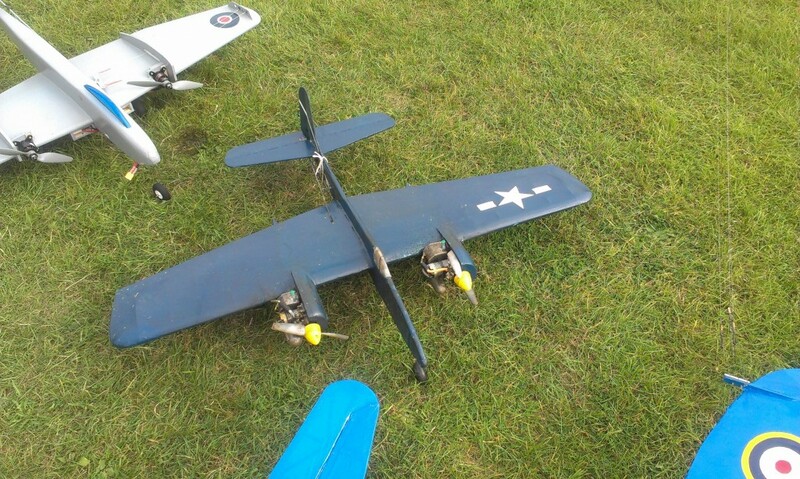 George Ford had brought quite a fleet of models to the meeting, but in the end only flew his Barracuda. With a best of 185.4 that netted him seventh place, it probably proved to be the right decision. However, that deprived us of flights with his Skua and Tigercat, which I’d been rather looking forward to, maybe for the wrong reasons! 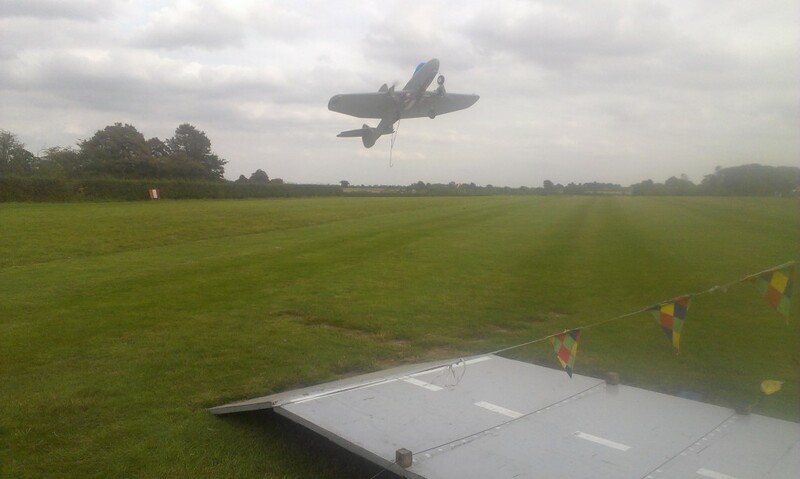 Who can forget George’s memorable back-flip and inverted ditching with the Skua at Leicester last year – truly an epic! The Tigercat is (I think) a Brodak kit version rather than a Jan Odeyn plan build. George originally powered it with two Enya 15s, but when one expired he replaced it with a 19 on the inboard side as per the advice in one of the late lamented Aeromodeller Annuals for extra out-thrust. Despite this he admitted that it’s really too heavy for these powerplants, but it’s a nice change from single engines and electric flight when the conditions allow. I was still busily replacing fuel systems on two of my models when George flew, so to my regret I didn’t manage to capture the ‘Cuda on camera, so here’s a shot of Geotge’s Tigercat instead. 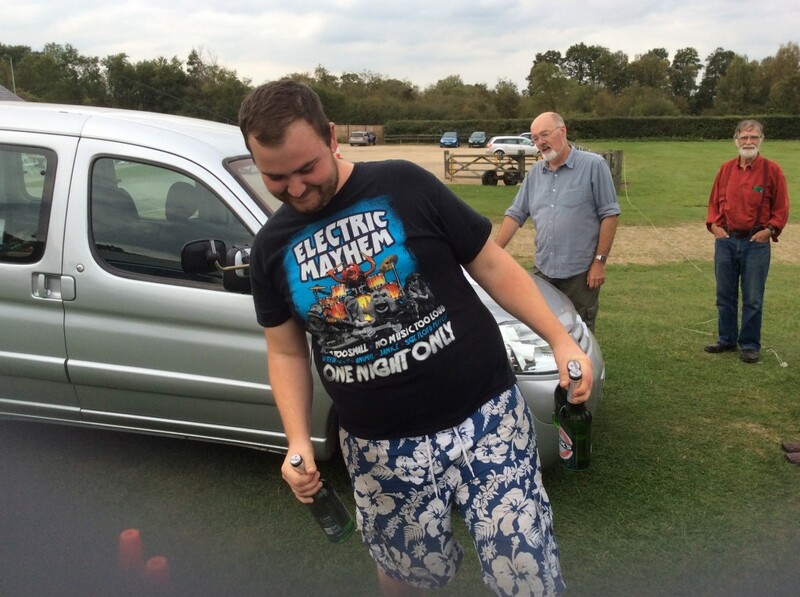 Bernard Searle was a tower of strength at the meeting, helping Andy to keep things running efficiently, managing the ready-line and pits, as well as dealing tactfully with complaints from one or two contestants who had not felt it necessary to add their name to the flying-list. To be fair, Saturday had been a very different and relaxed day, with Andy having to almost beg pilots to move their planes over to the deck; however, Sunday was very busy with 40 flights rather than 13 to fit in before 16:30 – a list was therefore essential. Bernard devoted so much of his time to this management role that his flying must have been affected – anyone’s would. He managed two scoring missions and one DQ with his SC53-powered Guardian, but misse out on any landing points. His best effort was 69.8, which gave him 15th place, but perhaps more importantly he also gained the respect and thanks of just about everyone there – top man, Bernard! The picture below shows the ready-line with five models waiting for the deck. At every meeting so far this year, there have been three of four pilots really in contention for the top places. 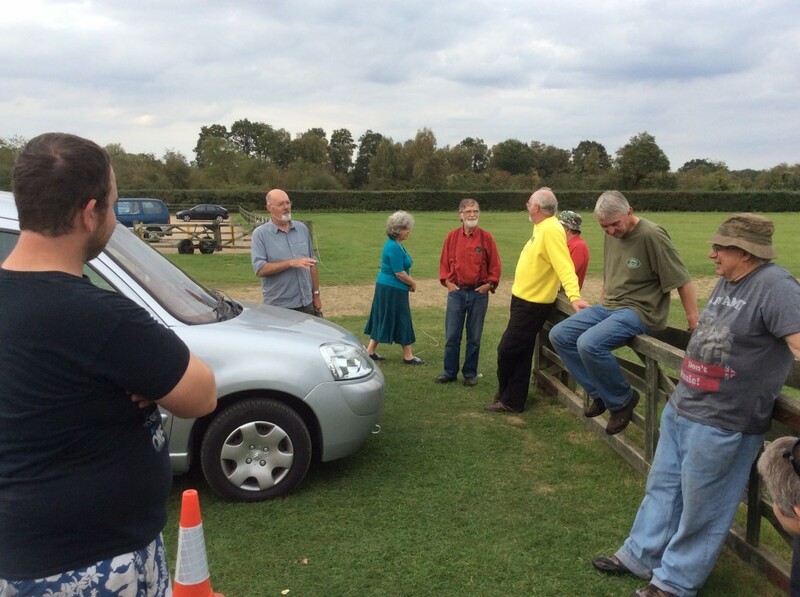 One of these is definitely Peter Tribe, who’s campaigned his twin-electric-powered Meteor III very successfully. I’ve actually made a video study of the flying-styles of the top competitors, hoping to learn something to improve my own flying, and the thing that always strikes me is Peter’s absolute concentration and fierce competitiveness, especially on the slow sector, which is of course where the event is won.I’ve also noticed his precision in placing the model – maybe three inches of clearance between the outbard wintip and the carrier superstructure, remaining identical on every slow lap. Talking to him in the pits, it’s clear that he practices far more than I do, and has a model that is perfectly prepared – now that is something I’ve taken to heart! The two rather murky shots below show the Meteor in slow flight and hooked up safely on the deck. Surprisingly, Peter dropped 60 points on his first two landings, but set things straight by nailing it on the third attempt for 232.3 points, which at this point put him in first position. Please indulge me by allowing me to explain why I am not troubling Peter Tribe or any of the other top guys at the moment. What I write below may well strike a chord with other pilots, who have suffered my problems early in their flying careers. There’s an old London saying: “After the Lord Mayor’s Show comes the dung-cart” – that’s about the difference between Peter Tribe and me! My MO-1 had been re-engined and a new fuel system installed but it still refused to give me an engine-run of longer than five seconds, so it was rapidly back in the car with that – because I’ve no time or place to test changes between meetings at the moment. The Hellcat had been re-balanced (2oz lead under the nose), and a new box of electronics one-third the size put together to reduce weight. This contains in a 50x50x30 box the Rx, LIPO, voltage regulator, two LEDs, two switches, output to the throttle servo and the relay and output to trigger the rocket-assisted take-off module – and it all works too (video will be added later). A new muffler and a smaller prop (9×6) completed the makeover. Eschewing the RATO option (flame from the rocket + deck covered in spilt methanol = incineration) she left the deck rapidly under piston power alone, ASP40 howling and the plane grooving very nicely, flying a lot faster than usual, that is, until a silencer bolt sheared, letting the muffler hit the prop, which shed a blade, which must have knocked the carb out of the engine – result, sudden silence and the usual walk of shame back to the pits. That left me with the Hellcat, whose old-skool metal stunt tank had decided to cut on every flight after about four minutes in the air. A rummage round the trade stands gave me three options, the best of which was a brand new SLEC 4oz tank from PS AeroProducts. I’d never used one before, but looking around the pits I suddenly realised that a lot of guys are. What’s not to like about a tank that doesn’t come apart, never leaks, and has all the inputs and outputs you need already in place? Back to the deck we went, and although the throttle range was still poor (slow was still far too fast) we made two full flights ending with two very fast 100-point landings, netting a best of 141.9 (12th place). To me, that made the whole meeting worthwhile. all 450 miles driving and about 275 quids worth of travel and subsistence. Yes, I’m easily pleased! 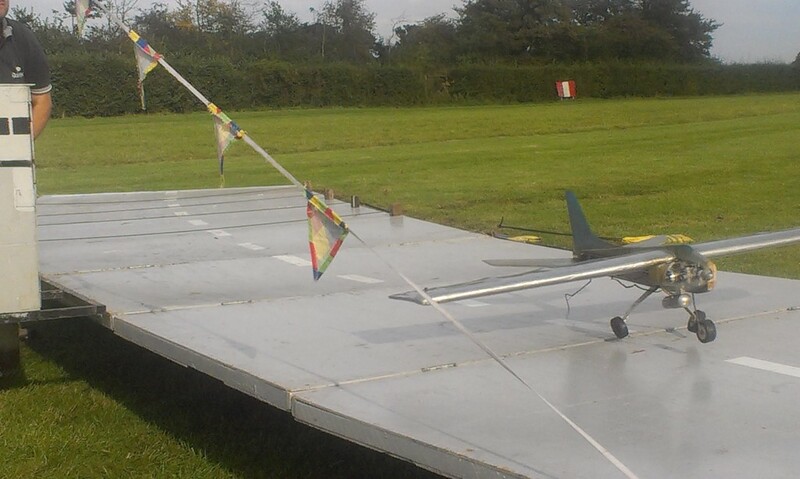 The picture below shows the Joe Just design with her new tank ready to fly. After me and my nonsense at the deck, Matt Cordwell was next up with his intruiging F-18, powered I believe by a West 36. It’s a really radical departure from the models we usually see, and I was very pleased that someone was prepared to push the boundaries back like this. I had seen the model in the pits at a couple of earlier meetings, but hadn’t seen it fly, so kept a watchful eye from the pits, but I believe that mechanical difficulties prevented Matt from launching, which was a real shame. Matt found himself being unexpectedly interviewed in the pits by His Honour Andrew Boddington, who is of course Dave B’s son and Editor of the Aeromodeller magazine. Matt gave a good account of himself and carrier, so we can hopefully look forward to some carrier-deck exposure in the next issue! 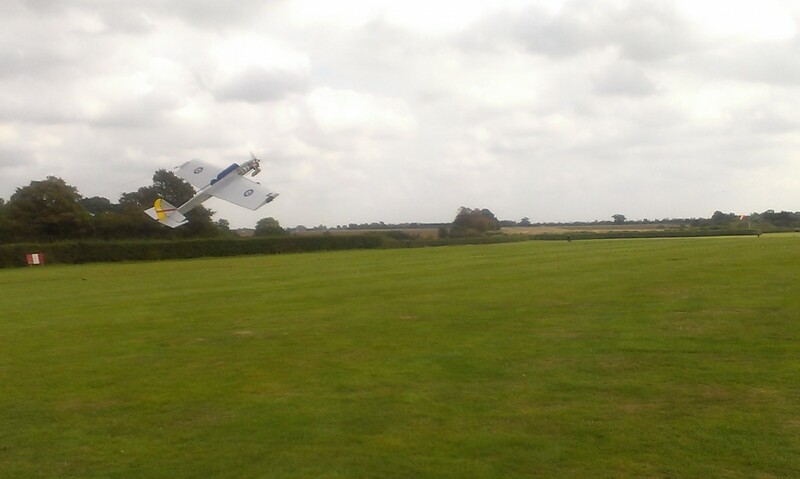 Ian Gilbert has flown exceptionally well this year, winning just about every competition he enters. When Jan Odeyn sent me his UK Nats photos, he also took the opportunity to express his admiration for Ian’s flying – and that’s no mean praise coming from the acknowledged European master flier himself. 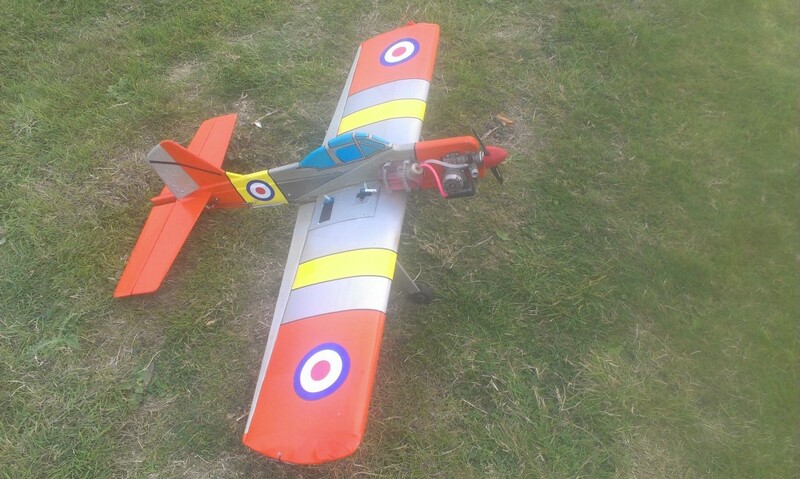 Ian has used a variety of models, but seems to have settled on his SC25-powered Fairey Spearfish. It’s a very neat, light and carefully constructed aeroplane, and is interesting insofar as it has an engine with barely half the capacity of most other models. Nevertheless, its slow flight responsiveness and balance is very nice to watch, and Ian’s approach to flying those slow seven laps is very different to other pilots; for instance, instead of Peter Tribe’s intense, forward-going, panther-like prowl or John Philipps’ relaxed stroll, Ian uses a unique sideways tight-rope shuffle, instep of both shoes always exactly on the centre hoop, eyes always directly upon the model. The conditions were very nearly perfect and the Spearfish took full advantage of them, with only the slight inconvenience of 40 dropped landing-points on flight 1. Fast laps are average-plus at around 32 seconds, but the slow laps are very slow and consistent at around 132, with a best flight total at this meeting of 252.7. As Andy said later at the prize-giving, that’s as good as he could recall anyone doing outside the do-or-die atmosphere of the Nationals. I like John Green’s no-nonsense, back-to-basics style! He doesn’t use an electric starter, a chicken stick, gloves, a field box, or a glow-stick. Instead, the ASP28 in his Crusader is thrashed mercilessy into life by index finger alone, its glow plug lit by a single D-cell torch battery with bell-wire soldered top and bottom. The throttle is electrically controlled throttle by a slider switch held in John’s left hand rather than being integrated with the handle. And do you know what? It doesn’t matter, because the plane flies excellently on both fast and slow sectors, and John is a very capable pilot. I find it reassuring that doing things the simple way like we all did back in the ‘50s and ‘60’ is still OK and produces results – John is living proof of that. His Crusader grooves very nicely, and I do like the tricycle U/C, a prop saver and a better chance of avoiding a back-flip! His three missions all scored well on flight times, but only the third picked up points for the landing, which was a surprise considering how well his landings had gone at OW back in July. However, the 100 points earned for that final touchdown pushed the Crusader past the magic 200-point mark, and netted its pilot fifth place overall – an excellent result. David Goddard’s Barracuda flew next, and again I regret that I’ve no pictures of either David or his model. Powered by an Enya40 (a great engine but not often seen in UK Carrier) the ‘Cuda made two flights, the first of which clocked a reasonable 32.1/70.5, which , together with full landing points was enough to give David 11th place overall with 158.4 points – his only other flight ended in the briny. The afternoon was wearing on at this point, and with less than two hours to go before the need to unmoor HMS Incredible and set her on course back to Marlborough, Andy and Bernard had to step up the pace. Some pilots hadn’t flown at all, while others still had some credits to cash in from attempts made earlier in the day. 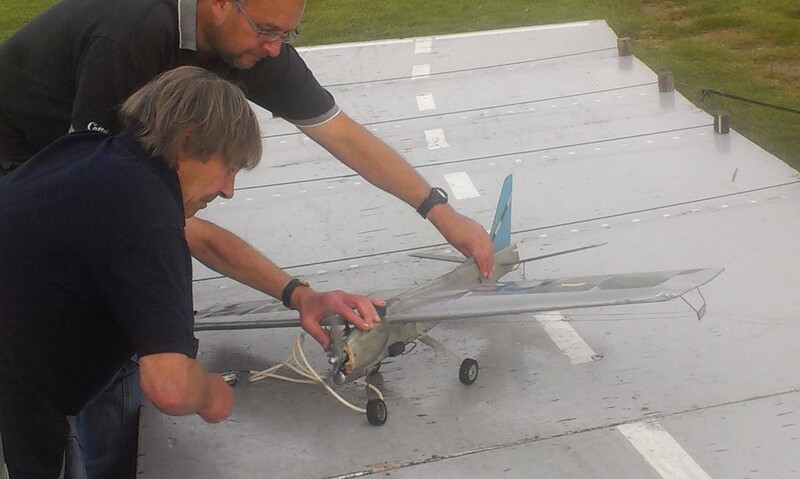 Everyone pitched in to move lines and planes to the ready area and keep the deck busy; the first up was Andy Green returning with his Zero from Saturday, which had given him some trouble with unplanned ditchings. Regrettably, the Mitsubishi lived up to its name on its first two flights, but redeemed itself on the last with 169.7 points – not enough to change the results as Andy’s scoring flight on Saturday made 175.5 for ninth place. Team Philipps then took centre stage, with four pilots and three planes. As reported earlier, John Philipps was always intended to be the team’s pacemaker with his Sea Hornet, ably supported by father Bob. John only flew two missions, but the scores were both very, very good – strolling round the circle in a relaxed manner, John made 237.6 and 240.2 – incredibly consistent, with slow sectors in the 150 second (2.5 minute) bracket. This combination of pilot and plane has done even better elsewhere, and is now well within striking distance of Ian Gilbert. What’s the secret? Planning, experimentation, building on proven elements from other models, maximum wing area and skilful piloting – I’m still working on nailing the first of these! John’s 240.2 gave him second place, just 12 seconds behind Ian – there’s going to be a real fight at the top next year between these two and Peter Tribe – worth waiting for! John’s dad Bob Philipps then tried his Supermarine 508, but it was suffering from an electronic throttle system ailment and ditched on two flights after the fast sector. Rather than go again, he retired and handed over to Nick Ford with his newly-completed Hawker Sea Hurricane, finished in an unusual but effective Russian Arctic colour scheme (all white now!). Nick Ford’s first attempt off the deck was a complete disaster, with the elevator sticking full up and the plane doing a loop and then trying to auger itself into the ground. 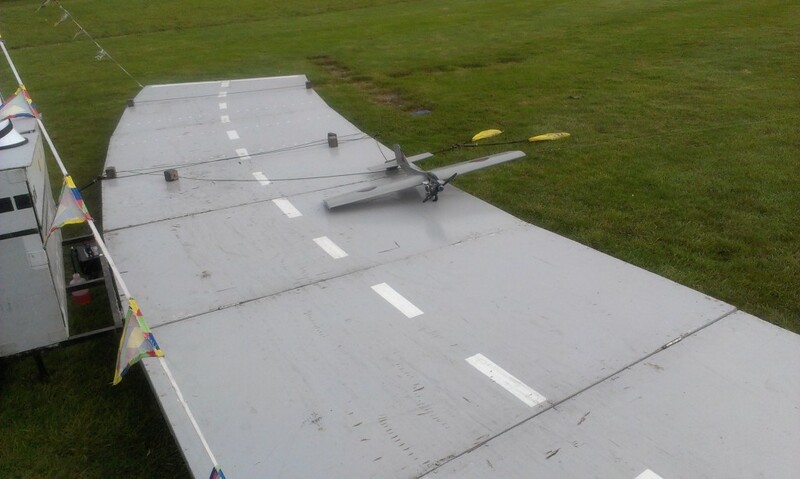 Back in the pits, George Ford was pessimistic about repairing the damage, but Nick was up for it, and to his great credit the plane was restored to flight in record time – isn’t Cyano and five-minute epoxy great stuff! I firmly believe that most competition machinery goes better after it’s been bent a little, and the Hurricane was no exception; despite clocking up a very leisurely 46.5 seconds for the fast sector, it was right on the money with 104.4 on the slow, giving Nick 177.4 points and eighth place; only four points separated Nick from Andy Green and David Cowburn, but he finished in front of them both, surely a just reward for perseverance, and ample evidence that every second counts. Yvette and Dave Horton (Team Philipps members, daughter and son-in-law) shared their SC15-powered Wildcat across five flights, but only Yvette put a score on the board with her first flight. It was a real shame that the model just put its port mainwheel off the deck after a very impressive 118.6 slow sector, reducing her score by 60 points to 132.1 for 13th place – a smidgeon to starboard and it would have been 192.1 for seventh! I asked brother John how long Yvette had been flying, and he said it was as long as he could remember, and that she is very competitive and would probably beat him if he let her fly his Sea Hornet! 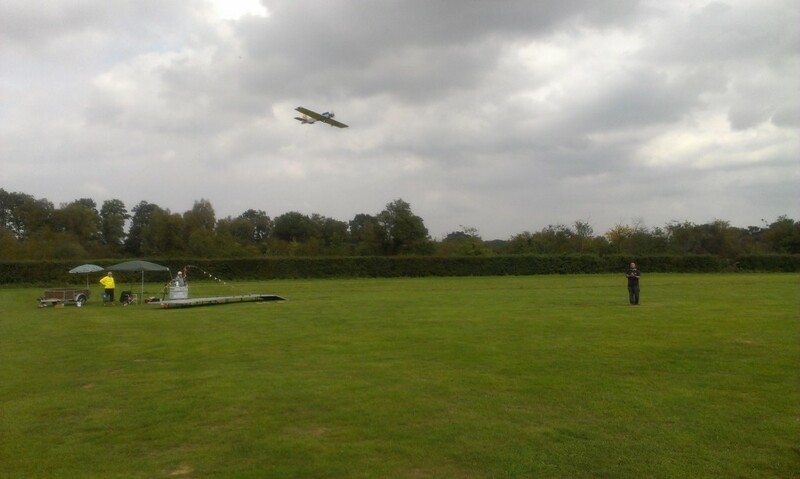 With only ten minutes left, Nick Ford tried his Sea Hurricane again but couldn’t improve upon his previous best score. George Ford, however, gambled everything on his one remaining flight and turned in a very respectable 185.4 with his Barracuda, snatching seventh place with only minutes to spare. 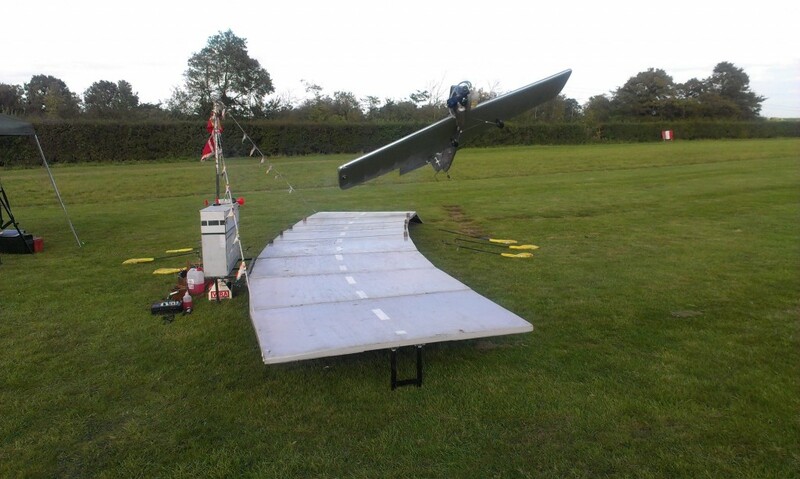 Right at the very last moment, Chris Howells decided to get some air under the wings of his new Leo46-powered Sea Balliol, converted from a stunter with all the hardware imported from his late lamented Zero (I’m still mortified,Chris…). 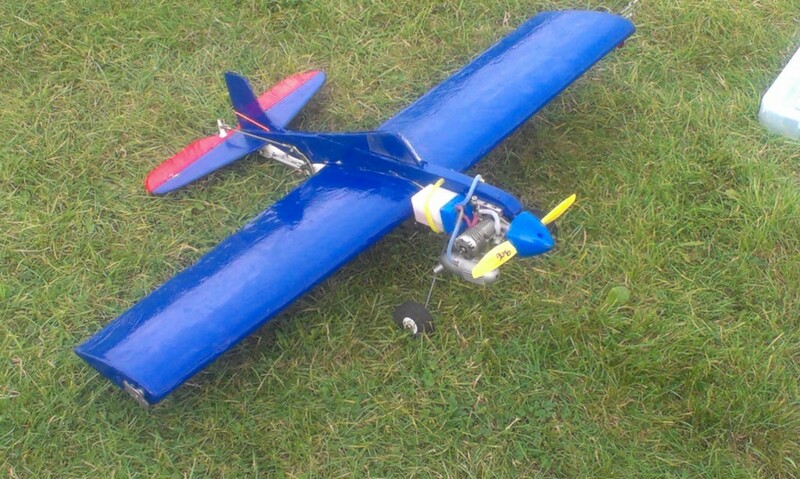 It’s a very impressive model, along the lines of Brian Hunt’s Balliol, and it actually flew very well with a 165-point score in prospect until a fuel feed problem sent the plane into the oggin, dead stick, for a DQ. While the deck was being rapidly dismantled and everyone clearing up to get their gear land-side before closing time (17:00), your correspondent decided to fire off a RATO charge using the new, lightweight system fitted to his Hellcat, as all the components had been tested on rigs but never in the plane itself. Hooked firmly to the ground, the countdown began, Chris Howells filmed it, then suddenly, with a mild roar and lots of flame and smoke the rocket fired perfectly – whoopee! Next year I’ll bring some fire blankets for the deck and do it for real…WATCH THE VIDEO! 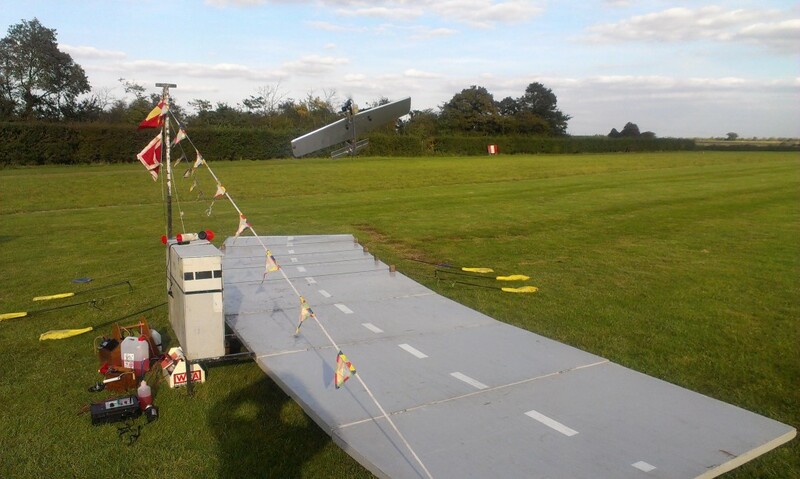 So ended a classic weekend of BCD action, with 19 pilots flying, 20 planes entered and 53 flights recorded. 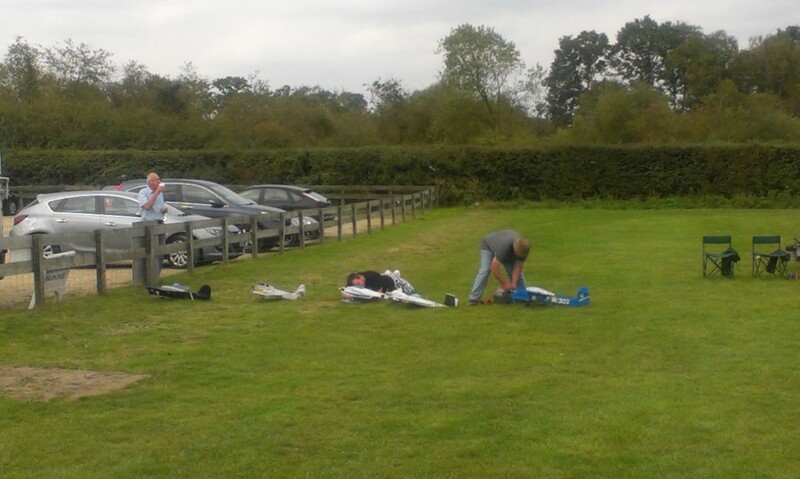 After the prize-giving a vote of thanks was made by all to Andy Housden and Bernard Searle who were towers of strength throughout the weekend, ensuring that everyone who wanted to fly was able to. Thanks are also due to Mike Welch, who once again navigated HMS Incredible from her home moorings to Old Warden – she is a grand carrier and a pleasure to fly from – thank you Mike! 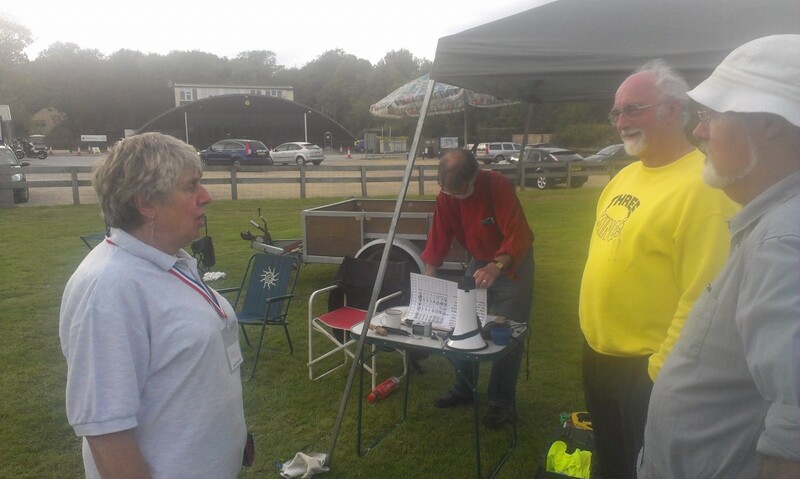 In the picture below, Andy and Bernard are talking to the lady organiser of these ModelAir events. She and her husband are stepping down now after many successful years promoting model flying events at Old Warden – this was the last one for them. Everyone hopes that these weekends will continue: to lose this venue would be a bitter blow for UK Carrier flying. That’s it – no more competitions now until Damyns Hall next April (to be confirmed). WRONG! A final ad-hoc competition was held in Germany in October – CLICK HERE for details! Flyco will be awarding some trophies again before then, and updating the site with some great material provided by our European friends. For now, have a great Christmas & New Year, and may your building season be successful!